Many of our customers buy our fire safety products in large quantities, either for re-sale or for larger installation projects. To this end, these customers are invariably contacting Safelincs to agree a volume price. To make the process faster and easier for the customer, we have created Bulk-buy Deals with some of the most popular products, such as fire extinguishers. These deals display the substantially reduced prices that match the quantity of products offered in the Bulk Buy Deals. Delivery is usually on a pallet with a free 3 to 4 day service. For some of the most competitive fire safety products, visit our Bulk Buy section. We of course welcome enquiries for other products not listed in the Bulk section. One of the speakers at the launch of Carbon Monoxide Awareness Week at the House of Lords in November 2012 was Dr Steven White. He gave a very interesting presentation on the long-term effects of carbon monoxide poisoning, some of which are only recently being fully realised. Dr White has co-written a factsheet that is published on the website of Headway, the charity that works to improve life after brain injury. With Headway’s permission we reproduce a short extract here. Like other types of anoxic brain injury, acute CO poisoning may lead to quite severe long-term neurological problems, with disturbances in memory, language, cognition, mood and behaviour. The damage to the basal ganglia, which is a particular feature of CO poisoning, may lead to a movement disorder resembling Parkinson’s disease. An unusual feature of acute CO poisoning is the delayed deterioration in neurological condition which may be seen in some cases, occurring anything from a few days to as long as five to six weeks after the initial exposure. The reason for this is not entirely clear, but changes in the white matter of the brain seem to be involved. It has been suggested that these may result from demyelination, in which there is loss of the fatty, insulating myelin sheath of the nerve axons, therefore impairing their ability to conduct electrical nerve impulses. Chronic (persistent and long-term) exposure to lower levels of CO, as can occur with faulty domestic boilers, may go unrecognised. The symptoms include milder versions of those seen in acute CO poisoning, with headache, nausea, dizziness, light-headedness, fatigue and sleepiness, difficulty concentrating and memory problems, as well as changes in mood. People may be aware that something is wrong, but be unable to identify exactly what is the matter, or may attribute the problems to overwork, stress or depression. If symptoms disappear while away at work, reappearing on returning home, or if other people in the same premises develop similar symptoms, it may become more obvious that there is an environmental cause. Although most people seem to recover following chronic low level CO exposure when the source is removed, it can also lead to anoxic brain injury. There have been some documented cases of subtle Magnetic Resonance Imaging (MRI) abnormalities and long-term neuropsychological effects. Treatment of acute exposure to CO involves immediate removal from the source of the poisoning and administration of 100% oxygen, together with general supportive medical care. Hyperbaric oxygen therapy is sometimes advocated for severe cases of CO poisoning and involves giving pure oxygen at increased pressures in a hyperbaric chamber. It has been suggested that this may improve the long-term neurological outcome, although it remains controversial. Hyperbaric oxygen therapy is a specialised technique, which is only available in a few centres. It may also be associated with complications of its own and it is not used routinely. More information about carbon monoxide poisoning and detection can be found on our websites. When fire broke out in The Snoozebox Marquee, a trained member of staff was able to quickly and safely put it out using a water mist fire extinguisher. The fire started when the guest put a croissant inside a toaster. “It was really too big for the toaster and soon caught fire,” explained Tom Dodson, Project Manager, Snoozebox. Snoozebox offers flexible hotel configurations from 40 to 400 rooms which can be fully operational and ready to welcome guests within 48 hours of arriving at almost any event or location around the world. Self-contained and with no need for mains services or flat terrain to be sited, they can be used at major sporting events, music festivals or by film and TV crews, military personnel and for emergency or disaster relief. Our broad-spectrum E-series water mist fire extinguishers from Jewel Saffire have always been rigorously tested and certified to the very latest standards. They were certified by LPCB, one of the leading international certification bodies. LPCB certification is part of the BRE (Building Research Establishment). On top of this certification, a second certification body BSI has now certified the water mist extinguishers and added their particular stamp to the product. The BSI’s certification stamp, often called the ‘kitemark’ can now be used in marketing materials and on the product. While this is superfluous to requirements, the ‘kitemark’ is a well recognised and trusted symbol and helps to market products. Our water mist extinguishers cover a very broad spectrum of fire risks, including traditional burning solids such as wood and paper, as well as burning liquids, gas and cooking fats. They are even safe and efficient on electrical fires (as long as a safety distance of 1m is adhered to). They tackle difficult fires, such as clothing fires and Christmas tree fires, are entirely harmless in their use and are environmentally friendly, as they only contain water. They also create a thermal shield between user and the fire and even clear the acrid smoke of fires. Safelincs recommends these extinguishers in particular for homes, professional kitchens, restaurants, churches, schools, nurseries, although the extinguishers are, of course, also suitable for general use and office areas. Landlords also benefit from these extinguishers, as the tenants will only require one type of extinguisher for all risks and do not have to learn how to use a selection of extinguishers for the different risks. They also have the added benefit of not requiring any cleaning up should the extinguisher be set off accidentally, as the water mist disperses into the air. The water mist extinguishers are available in three sizes: a 1 litre version mainly for domestic and landlord applications and a 3 and 6 litre range for businesses and organisations. 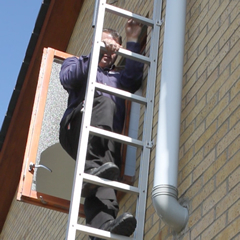 One of the first fire safety product ranges Safelincs introduced back in 2001 were fire escape ladders. Originally, these were aimed at domestic homes and families. By now, our range of fire escape systems and fire escape ladders has swelled and we have introduced several fire escape ladders that are suitable for businesses as well as home users. Notably the Saffold fire escape fold-out ladder is an escape system frequently used in business or public sector environments. Furthermore, this ladder can be made in any RAL colour had has been installed on listed buildings. To help our customers to find the right escape ladder for their application, we have created a help guide. It should assist you with the large selection of products and help you to understand the options that are available. Should you have any questions with regards to fire escape ladders, please ring us on 0800 612 6537 or email us at service@safelincs.co.uk. You can also send images and dimensions for us to check out.